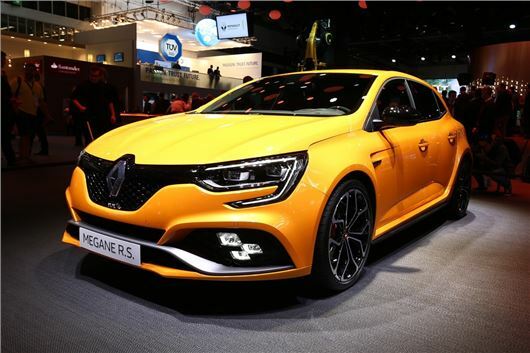 Renault has announced the new hot Megane RS, which has a 1.8-litre turbo engine producing 280PS and 390Nm of torque. It goes on sale in the UK in Spring 2018, with prices expected to start at around £30,000 – pitching it against the Honda Civic Type R and Ford Focus RS. Click above to see a video overview. The five-door only car has more muscular wheel arches and a rear diffuser, but (aside from the bright orange paintwork) the styling is subtler than its rivals from Ford and Honda. Inside, it’s a similar story with bucket seats and red stitching the only major changes over the standard Megane. Peak torque of 390Nm is available from 2400-5000rpm, so in-gear performance should be very strong – but acceleration figures are to be announced. There are two transmission options – a six-speed manual and a six-speed EDC dual-clutch automatic. Official economy is around 41mpg. There’s also a more powerful 300PS Trophy version, with 400Nm of torque. It’s likely to have more track focused suspension, but details aren’t yet published since it’s not due until the end of 2018. As standard the Megane RS comes with a Trophy chassis, with 18-inch alloy wheels and Continental tyres. Optionally, a stiffer Cup chassis can be specified, which gets stiffer suspension, larger 19-inch alloy wheels, Bridgestone tyres and stronger brakes. Optionally it can be equipped with a mechanical limited slip differential. Both chassis variations come with 4Control all-wheel steering, which is designed to provide nimbler low-speed handling and better high-speed stability.